After I finished this book I spent about 10 minutes staring up at the ceiling, thinking: Wow. This book takes a very unique narrative approach–it is a novel told in 17 different short stories, all centered around one terrible and tragic event, a school shooting. Each story is by a different author of YA literature, some of whose names I’m familiar with, but many of which I’ve not yet read. The stories are non-linear. Some take place over various periods before the shooting, some after, and some during the actual shooting. The unifying thread throughout all of the stories is Kirby Matheson, the teenage shooter who kills a teacher, several of his classmates, and injures a dozen more before finally killing himself. Kirby never speaks to us directly, but the people connected to him do–friends, acquaintances, family members, his classmates–some that knew him intimately, some that didn’t know him at all. You never really get a sense of who Kirby was or why he did what he did, but the gaps in your understanding are precisely the point of this book. After such tragedies occur, we pause to wonder why seemingly “normal” people become violent. Was he bullied? Was he mentally ill? Were there signs? Did his parents know? 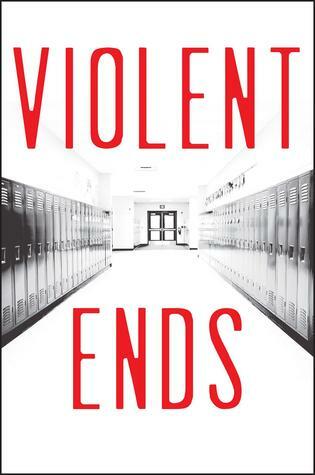 “Violent Ends” offers no clear answers, just a picture of an American tragedy and the people left in its wake. Be cautioned that all of the stories in this book are not created equal, however. Some were quite forgettable, but there were several standouts. “Grooming Habits” was sensational, as well as “Survival Instinct,””History Lessons,” and “Presumed Destroyed.” The authors of these stories I will most definitely be reading in the future, just because the writing was that damn good. Read this book. Once you start it you won’t be able to put it down.